Maryam Hallaj, a Temple University senior, will receive a GSK Opportunity Scholarship at a formal ceremony on Wednesday. Hallaj and her family fled Syria in 2011 when the country descended into civil war. They spent several months living in unstable homes in Philadelphia before finding a permanent home in Montgomery County. Maryam Hallaj remembers fleeing Syria five years ago with just a half-full suitcase in her hand and her family at her side. The country was descending into civil war following nationwide protests calling for the ouster of President Bashar Assad. As the conflict inched closer to Aleppo, Hallaj's parents decided it was time to return to the United States. The family had spent months penned inside, the sound of machine guns occasionally piercing the air outside. But while life in America offered protection from the dangers of civil war, it did not come easily. Hallaj, then 16, and her family spent several months living in a car, a garage and an unfinished basement before landing on their feet in Bridgeport, Montgomery County. Hallaj persisted through it all and is now pursuing an architectural career. Yet, the experience left her empathetic to the millions of people who have fled the war-torn country. Entering her senior year at Temple University, Hallaj hopes to one day design pop-up spaces for refugees. Hallaj, 21, is one of five Philadelphia residents who will receive GSK Opportunity Scholarships in a formal ceremony held Wednesday at GlaxoSmithKline's Navy Yard offices. The annual scholarships, worth up to $20,000, award students for overcoming significant adversities along their pursuit of education. "It's mind-boggling, I guess, would be the word," Hallaj said. "Because I don't think of myself as someone who's really gone through a lot of hardships. But when I tell my story to someone else, they're like 'that's crazy.' It's interesting that I would be a recipient." The other scholarship winners include Jose Ascencio, a Temple student who was born two months premature; Evan Allen, an Indiana University of Pennsylvania student who shifted living among different family members five times before he was in sixth grade; Ethan Ake, a Temple doctorate student who overcame abuse and the sudden death of his mother in high school; and Jasmine Davis, a Bloomsburg University student who helped care for her disabled grandmother and brother's baby while moving from place to place. The recipients were selected by a panel composed of community leaders, educators, social workers and representatives from GSK and The Philadelphia Foundation, which helped establish the scholarship program seven years ago. Among a crowd of 25 finalists, Hallaj stood out for her persistence, said Marti Skold-Jordan, a GSK spokeswoman who served on the selection panel. "When we looked at her story, all the way around she had the passion, she had the drive," Skold-Jordan said. "She knew that education was the way to move her forward. She never said, 'No, I have all these things around me that are telling me I can't do it.' She always had that 'I can do it' (attitude)." Hallaj was born in California, but spent much of her early childhood living in a Phoenix suburb. Prior to entering sixth grade in 2005, her family moved to Syria, where her father owned a paper warehouse. Business was the primary reason for the move, Hallaj said. But being half-Syrian and raised Muslim, Hallaj said her parents also wanted to expose her to Syrian culture. Previously homeschooled, she entered a classroom for the first time in a foreign country. "I could say 'Yes' and 'No' in Arabic, so I had no idea what was going on," Hallaj said. "It was definite culture shock. I left all my friends that I had always known in Arizona. Leaving everything and having to start all over when you're 11 is really, really challenging." Yet, Hallaj credits her time in Syria for bettering her. It toughened her, but also made her more outgoing, she said. And it helped her learn how to set and achieve goals. In short, Hallaj said, it made her the person she is today. "Living overseas, for me, I had to work 10 times harder to do anything," Hallaj said. "The language barrier alone was so much that I had to put in so much more effort to get to the same place I do now. ... When you work in a language you're familiar with, it comes naturally." But six years later, the teenager who had grown accustomed to her surroundings was uprooted again – in the most trying of circumstances. Civil war broke out in Syria after pro-democracy protests in 2011 sparked civil unrest. But the conflict took time to consume Aleppo, Syria's largest city, located near the Turkish border. Eventually, Hallaj said, it became too dangerous to go to school. For months, her family barely left the house. Three times, they heard machine gun fire outside. "It was terrifying," Hallaj said. "We used to hide in the hallway ... until they would stop. Even then, it wasn't nearly as bad as after we left. Right after we left, it just switched." With rebel forces encroaching on Aleppo, Hallaj's parents decided to flee. They took the first available flight, taking only a handful of possessions from their house. Hallaj is unsure what, if anything, remains of their home. "It was probably raided or stolen – if our house is still standing," she said. The hardships did not conclude when the family arrived in Philadelphia, where Hallaj's father owns a used car dealership and car wash on Roosevelt Boulevard. With nowhere to stay, the family lived at the facility for nearly two months, sleeping on air mattresses or blankets. "We switched between the office and the garage, depending on what was vacant," said Hallaj, the oldest of four children. "Some nights we slept in the car, depending on what the situation was. Then we moved with a family friend – they had an unfinished basement they let us borrow." The basement provided a bathroom, a couch and room for their mattresses. The family stayed there for several more months until their finances stabilized and they moved into a house in Bridgeport. Finally, Hallaj returned to school, enrolling at Upper Merion High School, where she graduated in 2013. In some ways, Hallaj said the period remains a blur. It's an experience she still is processing. "I have a harder time now dealing with it than I did then, surprisingly," Hallaj said. "I guess it's guilt that I was able to leave and other people aren't. As a 16-year-old ... I couldn't process it the same way. I was kind of sheltered, because, naturally, you want to shelter your teenagers and kids from something that's going on that's bad." At least 250,000 Syrians have died in the conflict, according to the United Nations, which stopped counting in 2014 because it lacked confidence in the data. One group, the Syrian Center for Policy Research, now puts the number of fatalities above 470,000. Millions of refugees have fled the country. Since moving back to the United States, Hallaj said she has become more critical and outspoken on current issues than many of her peers. But her experience in Syria also is shaping her architectural future, too. "At this point, I'm very interested in creating temporary pop-up spaces for refugees," Hallaj said. "They can be set up where refugees need them, taken down, and shipped in a container somewhere else and popped up again. It's something that can be universal, developed for different climates and different environments." She also serves as a graphic designer for Narenj Tree Foundation, a Norristown-based nonprofit that ships clothing, food, medical supplies and hygiene products to refugees. Last summer, Hallaj volunteered as a tour guide for students transferring into Temple's architecture program. She not only helped students set up their academic pursuits, but also provided housing recommendations. Hallaj's efforts impressed her academic adviser, Taheerah Entsuah. "What really made Maryam stand out happened last summer – that's when I really got to know her and see her work ethic," Entsuah said. "I don't think she's ever had less than two jobs at once – sometimes, as many as four jobs. She somehow manages to balance it all, still get good grades and be a leader to new students." Upon graduating, Hallaj hopes to work at a firm as she explores the aspects of architecture that most interests her. At some point, she plans to return to school to obtain a master's degree in either architectural design or fine arts. "I need to figure out if I really want to work in a standard, traditional architecture field or if I want to do something more sculpture-based, like installations, beer gardens, temporary spaces (and) pop-up gardens," Hallaj said. "That's where I'm leaning toward. But I do want to see what's there for me in a more traditional field." 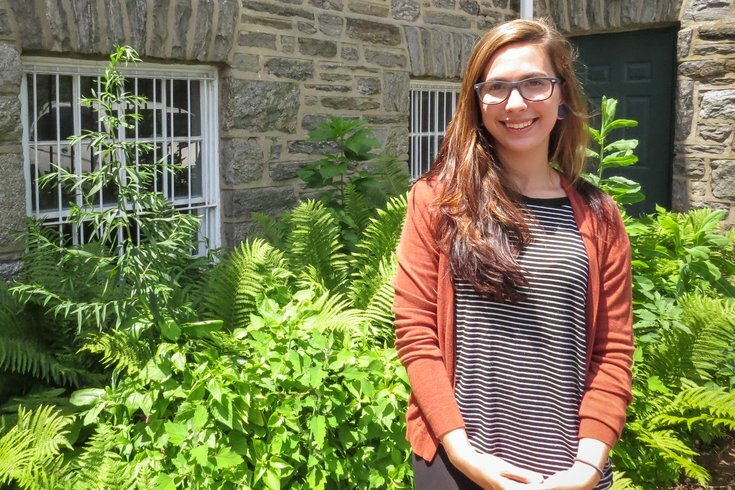 She'll get that experience later this summer when she completes an internship at a firm in Jenkintown, Montgomery County. In the meantime, Hallaj is teaching art to students at a Yes! And summer camp in the Germantown section of Philadelphia. "I always understood space really well – how I act with the space around me and how others interact and how I interact with people in space," Hallaj said. "That's always something that made sense to me, no matter where I was. I didn't need language for it. I didn't need to understand people, necessarily. I just needed to understand my relationship to space. "I want to give that to other people. I wasn't able to articulate that when I went into architecture, but I am now."